It's time we all learn about the changes that will benefit the world! The time is here for reducing our dependence on fossil fuels. Author Tom Rand, and the Eco Ten team, bring you the relevant information for you to be part of this important global solution. "Kick the Fossil Fuel Habit, 10 Clean Technologies to Save Our World" is a new book about hope for the future and how the changes we make today can impact and improve the world for the next generations. This is a book for teens and adults - but it's a book your children will want you to read. It's their future we are concerned about! This book will proudly sit on your coffee table and your kids will soon start asking what you know about wind technology and where the electricity in your house comes from! You probably should know those answers. Who the heck is Tom Rand? Author and noted caped crusader, Tom Rand started professional life as a software renegade in high school. Then he went legit, building a software firm spanning three countries. After selling it in 2005, he went after climate change full-time as a venture capitalist. Now based at the highly respected MaRS innovation centre in Toronto, Canada, he believes technology already exists to kick the fossil fuel habit. Not only is a world powered by clean technologies possible - it's absolutely necessary! The futures of our children depend on it. It's their world...but it's our job to pass it on to them! Watch the 5-minute video Trailer! 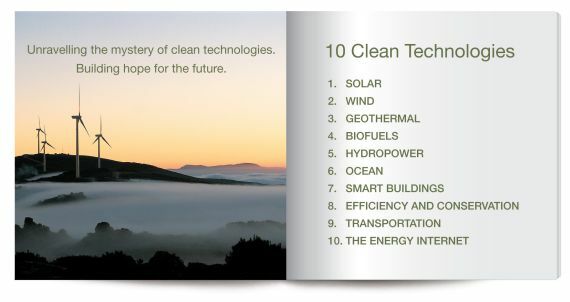 240 pages of stunning photographs and timely information on 10 Clean Technologies that are available to help us reduce our growing dependence on fossil fuels. "If the climate crisis had struck fifty years ago, we would have had no alternatives to fossil fuels. Today, there are many alternatives, and Tom Rand's book "Kick" is a superb introduction to them." 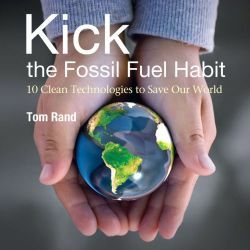 "Tom Rand makes a compelling case that we must adopt clean technology now. We all have a responsibility to future generations to act aggressively to avoid wide scale climate change. Refocusing our economy to adopt alternative, clean sources of energy is our best hope." "With greenhouse gas emissions continuing to climb, and the effects of climate change already apparent, global action on climate change is urgent. That's why we need innovators like Tom Rand. People who are commited to positive change and who understand the importance of moving to a clean energy future. His new book, Kick the Fossil Fuel Habit, will help to make this change a reality. Through clear presentation and beautiful design this book paints a compelling picture of the future we can choose to have." "Tom Rand does an excellent job of describing, in clear and concise terms, the bold steps required to truly embrace the potential of renewable energy technologies. Someone who practices what he preaches, Rand is a credible environmental champion and this book should be essential reading for anyone who is concerned about how we develop a 'green' society." Tag along on our mission to bring information about clean technologies to the general public!